So here is another installment of Things Left Unsaid in which I write about things that I never got around to documenting while I was knocked up last year. 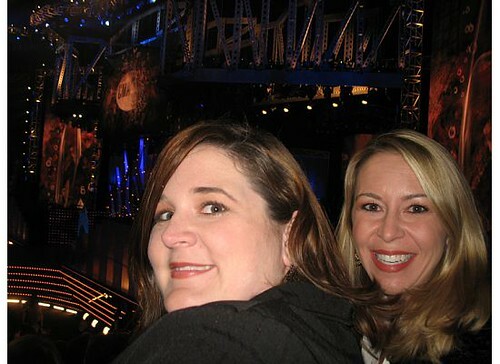 My sister was able to score tickets to the CMA awards last year. She came to me one day all excited and asked if I wanted to take my seven and a half month pregnant self on a road trip to Nashville to attend the CMA’s. And I was all, HECK YES! Some people, like me, never realize that you can buy tickets to the CMA’s just like a regular old concert. Right there through Ticketmaster. Who knew? Not me. Until last year, anyway. 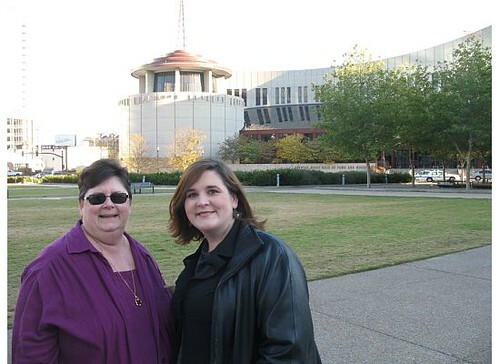 So my mom, sister, unborn child and I all headed up I-65 to Nashville one day last November to attend the awards show. My sister hooked up her ipod so along the way we sang every Willie Nelson, George Jones and Conway Twitty song ever recorded. And we laughed at the words, because some of them are really hilarious. You’ve got to admit that Conway was onto something when he said “You’ll be just a lovely, and I’ll still be around, and if I can I know that I’ll still love to lay you down.” IF I CAN? Obviously written before the days of Viagra. And then Vern Gosdin begs the question, “Lately, your head hurts every night. Could it be you wear your clothes too tight?” It’s like he was married to Kelly Pickler or something! 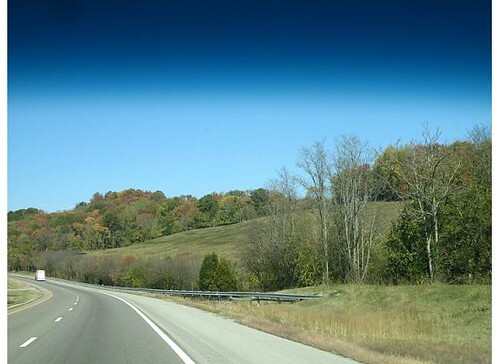 It was a memorable road trip. I bet Boudreaux enjoyed the mini-concert along the way. 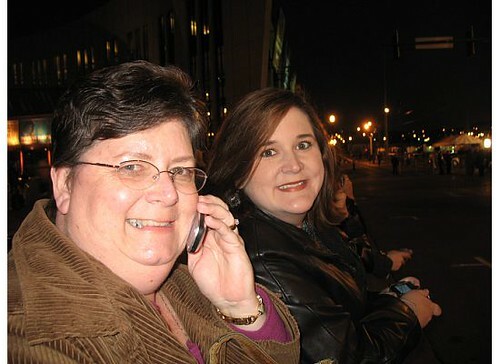 Once we got to Nashville that afternoon and checked into our hotel to get ready for the evening. Check out my sparkly baby belly! Once we were all spiffied up, we headed out to downtown Nashville to wander around a while before the show. 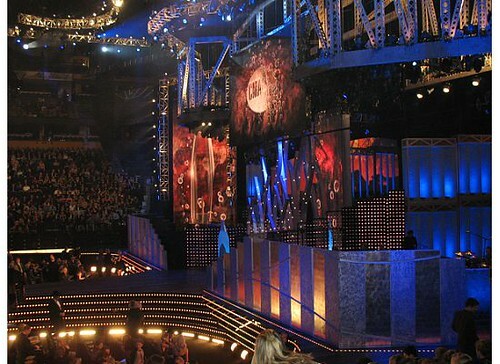 The CMA’s were held at the Sommet (pronounced Sohm-may, for those rednecks like me who don’t know how to pronounce words with a silent “t”) Center in downtown Nashville. After we walked around town a while and had dinner at a local restaurant, we went to watch the red carpet arrivals happening behind the building. As I stood freezing on the sidewalk with my big pregnant belly pressed against the barricades, I knew there was no place I would rather have been. I had so much fun watching all the arrivals, and shaking hands with the stars who actually crossed the street to say hello to us peons in the cold. 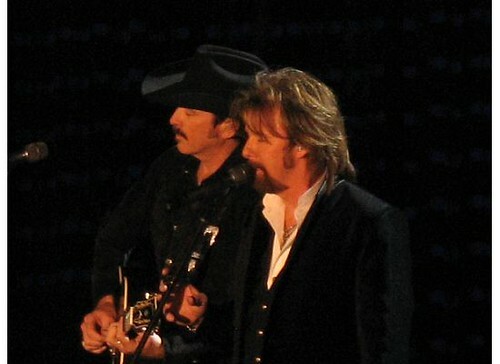 Here was Kix Brooks from Brooks and Dunn. He was a nice dude. 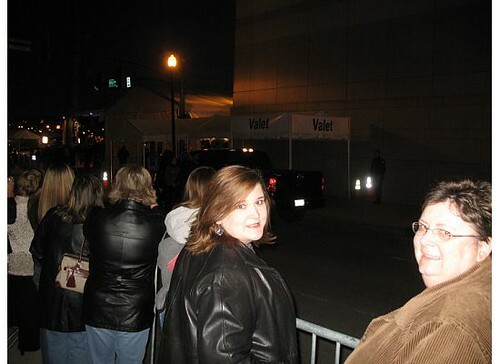 We saw Keith and Nicole arrive, and Jessica Simpson and her creepy Dad, and a lot of lesser known stars. 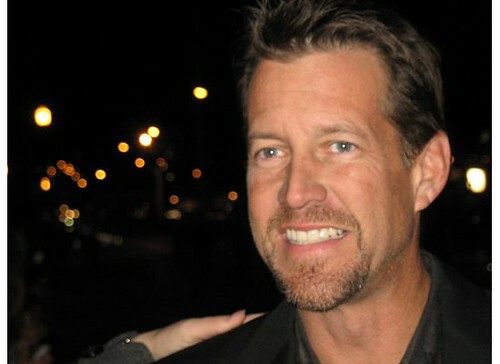 I shook hands with James Denton from Desperate Housewives. Also very nice. We were super excited to be in the crowd and watch it all go down. Once inside, things got even better. We had outstanding seats just to the right of the stage. From our viewpoint we could see the entire front rows and all the stars up close and personal on the stage. 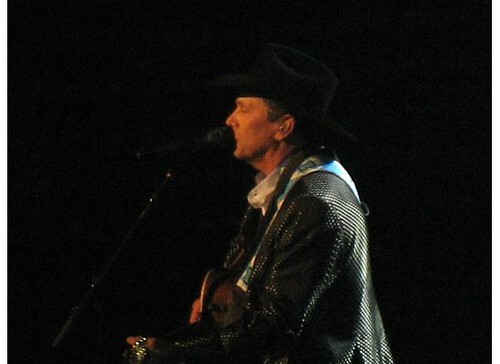 It was a great way to see country music’s elite at their finest. I would highly recommend it to anyone! You get serenaded by all the country music superstars at once and only have to pay for one concert ticket. Plus there were movie stars like Nicole Kidman there to sweeten the deal. Let me just say that Nicole looked like a greek goddess in that room. For the most part all the country singers looked just like you and me, except with more makeup and sequins and bigger hair. But Nicole Kidman was in a class by herself. She stood a head taller than anyone else, and she just glowed with beauty. She was absolutely stunning. We later found out that she was probably a few weeks pregnant here that night. About halfway through the show Boudreaux was pressing on my bladder, so I had to get up and go to the bathroom. The Sommet Center is basically a big arena just like any other sports arena in any big city. There are concession stands all around the outside perimeter of the place. So I headed out into the concession stand area that was closed off with thick black curtains. When you leave the arena during the show you are not allowed back inside until the next commercial break because the glare of the fluorescent lights wouldn’t look real good on film. After using the restroom and stretching my legs a bit, I had a long wait before they would allow me back inside the arena. I decided to go buy a drink at the concession stand. As I was getting a straw for my drink I notice this guy standing next to the condiment bar. The bar was set up with all the fixings for a hot dog like kraut and relish and mustard, etc. Upon further inspection I noticed that the guy didn’t have a hot dog in his hand. Instead, he was eating fistfuls of pickles directly off the bar. With his fingers. Just picking them up and tossing them back. And then I realized that he was completely hammered. Totally drunk, with a raging craving for some pickles. If he hadn’t been so toasted and so male, one might have thought that HE was the pregnant one the way he was snarfing down those pickles. This amused me, so I chuckled to myself and walked back over to stand in the tunnel that led back inside the arena. I was standing there sipping my drink and waiting patiently, when up behind me walks Pickle Man. He stumbles in the tunnel next to me and strikes up a conversation. We chatted for a minute, and I realize what appears to be a conversation to me is actually his poor attempt at flirting! I was being hit on by the Pickle Boy! It shocked me, not only because I was nearly eight months pregnant and obviously married (hello, wedding band?) but also because it had been so long since anyone had hit on me that it took me a while to realize what was happening. Not to mention it was coming from a dude who smelled like Miller Light and kosher dills. He was trying hard, too, using all his best lines. He even asked me to come join him at his seats! I quickly declined, and said I had to go find my mom and sister. Just then the curtain opened and we were allowed back inside. I ran to my seat and tried to hide behind my program until he passed on by. Then I called J and told him what had just happened. He got a hearty laugh out of that one. The rest of the night passed too quickly, and soon we were headed out the door with nothing but the memories. 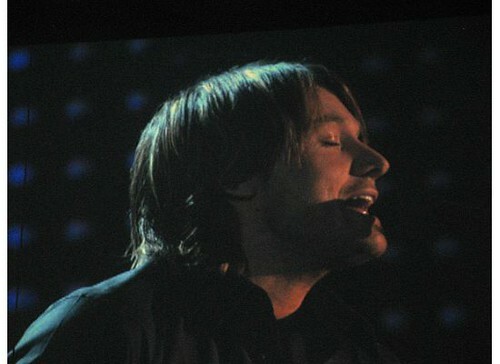 And 436 photos of our favorite country music stars. 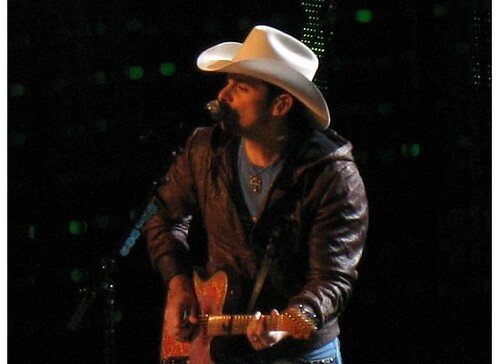 Brad Paisley performs “Cooler online” song while Kelly Pickler and Taylor Swift dance with the guys from the marching band. Here’s Brad again. I love how casual this award show is. George Strait. My childhood is filled with memories of his songs. 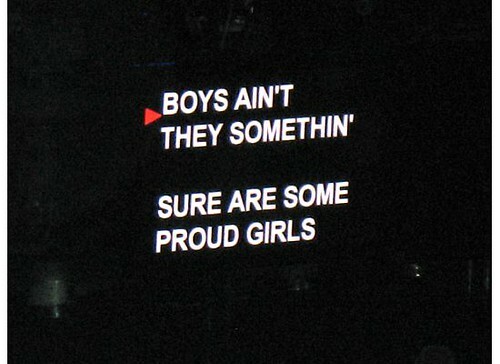 Some performers had the words to their songs on the teleprompter. George was one of them. All of the presenters had words on the teleprompter except for Vince Gill. When he was onstage it just said Vince Gill: (IMPROV) He must be talented to be on stage and just improv all his lines, totally at ease. Keith and Nicole sitting next to George Strait and his date, Reba and her husband, with Miranda Lambert behind them. Next to Miranda is Papa Joe with Jessica Simpson’s nose in the edge of the photo. 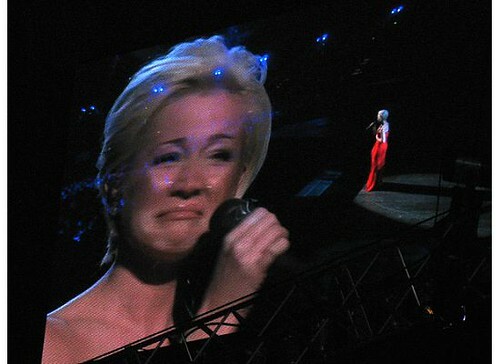 Kelly Pickler broke down in the ugly cry while singing the song she wrote for her mom. 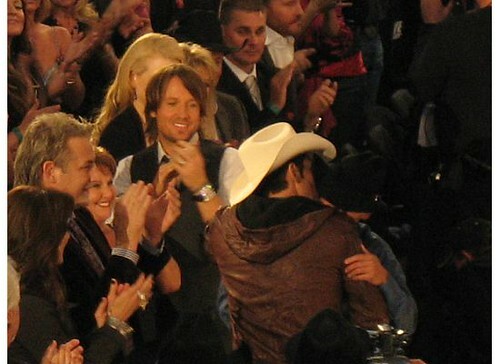 Keith Urban claps in the background as Brad Paisley hugs Kenny Chesney, the new Entertainer of the Year. 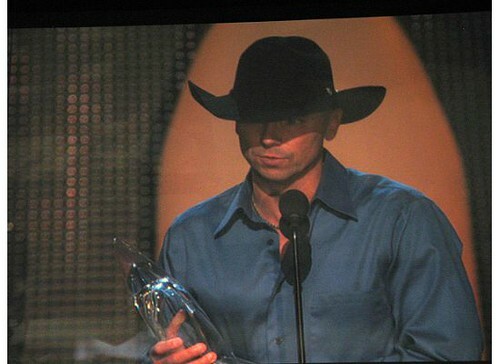 And here is Kenny accepting his award on the big screen. My sister had so much fun that she is doing it all again this year. 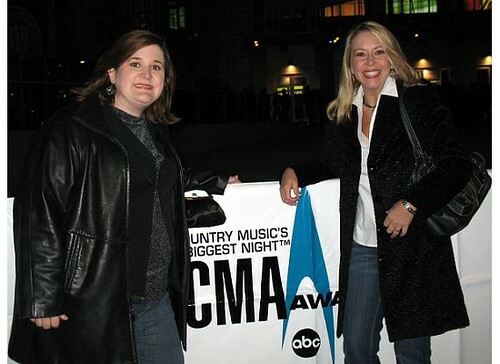 So stay tuned for more photos and stories from the 2008 CMA’s. As for me, I had to decline this year. I have a sick baby, and a strong aversion to pickle-snarfing wierdos who might want to try to pick me up. Oh my gosh that looks like so much fun!! I love all the pics!! I’m adding that to my list of things to do in the future!!! That is SO cool. I totally had no idea you could buy tickets to that. I was really hoping that your Pickle man was going to turn out to be some country superstar….. that would be HILARIOUS! And now I get the title of this post! Hilarious!! That looked like such a fun night. Awesome!! I love all the old school country music, too, but I hadn’t really thought too much about the words. So I’m totally glad that I checked back in! This looks like a blast! Add me to the list of people who didn’t know you could buy tickets to the CMAs. I have to admit that I also wondered if the drunk guy was a “superstar”!